One of the biggest mistakes teachers make when approaching race and racism issues in the classroom is pretending like they don’t exist. 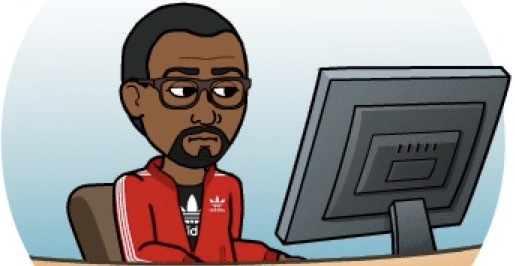 Although I assume positive intentions behind statements like, “I don’t see color”, or ”I am colorblind,” those statements and corresponding actions are actually counterproductive to the process. Race talk can be uncomfortable, but it is necessary in order to address the issues we have plaguing our nation today. Teachers need to be trained and supported with cultural competency PD so they feel confident in addressing issues in the classroom. I can recall a school I worked in and a teacher brought a concern to me regarding race. The teacher, who was a white female, spoke to me in confidence about an interaction between several students in her class. As an African American man, my upbringing and experiences differed some from my teacher colleague which actually worked in our favor. The teacher told me that an Asian American student told her that she wanted to be white like the majority of her classmates. She also said a few students in the class asked her why her eyes were slanted. What is most alarming to me is the thought that the young Asian American girl wanted to be white. She clearly was feeling indirect pressures from her experiences in school to change, which is a problem. The statement about her slanted eyes came from a stance of natural curiosity in my opinion, which is common among students. My teacher colleague and I both felt we needed to do something to address this, so we decided to do a diversity talk with the kids. 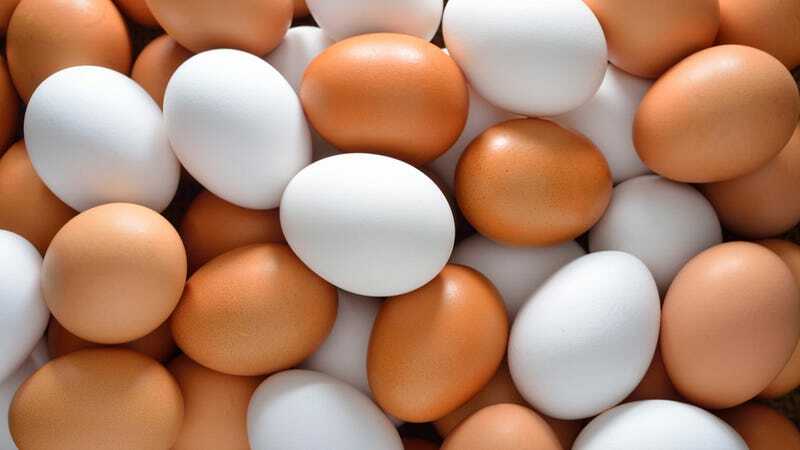 I came to her classroom and we cracked a white egg and brown egg into two clear glass bowls. We showed the students the identical makeup of the two yolks and related it to our human genes. The reality is the exteriors may differ, but we are the same inside. We also encouraged students to ask questions, embrace differences, and celebrate diversity. Racism is a learned characteristic. As the end of the school year approaches, you may find yourself fatigued. The year has been taxing mentally and physically and you are ready for a break. The same students who have required redirections are still in high needs of support. The pressure of wrapping up assessments, grades, etc. is mounting up. You now notice the sprint you had after spring break has come to a limping walk. 1. Eat. Make sure you are eating well rounded meals throughout the day. Don’t skip breakfast because it gives your body the fuel needed to begin the morning. Try eating light snacks such as veggies, fruits, nuts, and yogurt in between meals. 2. Drink. Water keeps you hydrated and energized. Try doing a water challenge with co-workers. 3. Sleep. Sleep is one of the most critical, yet overlooked activities for countless educators. Getting enough is essential for focus and concentration. I recommend setting a ‘go to bed’ goal and sticking to it. Also, once you call it a night, shut down your television and smartphone. 4. Promote the positive. Frustration and complaints will surely rise during this time of year. Instead of feeding the negativity fire, which is ineffective for staff as well as students, choose to reframe situations. Find the positive out of every moment and publicly state it amongst your colleagues. Keep an upbeat and energetic spirit. It’s contagious. 5. Make it fun. Make the ending of the year fun for everyone by being creative. One idea is to put on themed potlucks for staff. Food always brings out happiness. Spirit days are another great idea to bring smiles into the environment. Increase participation by rewarding the best spirited folks in your building. You can also take advantage of the weather and learn outside. Kids appreciate an occasional break in routine, especially for spontaneous exuberant learning environments. Although simple, I recommend you stay mindful of these 5 tips. End the year on a happy note. There’s no better way than to send kids home for the summer feeling happy, energized, and accomplished. Educators should also leave for break feeling the same way. Educators are busy. Our work is demanding physically and mentally. In a 10 month school year, it’s easy to get caught up in a routine and ‘take days off’ cognitively. Let’s not get in the habit of doing this because our kids deserve the best ‘us’ we can give everyday. Being reflective puts you in a continuous cycle of learning and improvement. Reflection assesses your knowledge, attitude, behavior, and skills as it relates to content and kids. We ask students to monitor their learning and self-assess, so we should do the same. Educators are extremely busy in today’s society. They are being asked to care for the social, emotional, and physical needs of multiple busy bodies day in and day out. On top of the student needs, there are also curricula demands, parent inquiries, and other tasks educators handle daily. It truly takes a superhero type of person to balance such a heavy workload. Every superhero has an archenemy. If educators are not careful, the growing demands of their work can easily spill over onto their personal lives outside of school. I am sure we can all think of an educator we know that cannot seem to turn off their work for the day. Even outside of the school, some of these educators who have fallen victim to work overload are consumed well into the evening with work related tasks. This simply is not healthy and it can lead to potential burnout. It is also unfair to significant others who may feel they have received the short-end of the stick. I am afraid our work will not become less busy. Knowing this, we need to make sure we are efficient and disciplined. We have to know when it is time to cut work off for the day. About seven years ago I received life-changing advice from my mentor, and Principal of Muskegon High School, Dr. Arthur Garner Jr. What Dr. Garner told me still replays in my mind today. As his rookie assistant principal, I was unable to effectively stop my workload from trickling over into my personal time. Dr. Garner simply said, “Rinny, you have to know when it is time to quit for the day. Don’t burn yourself out. Go home and be a great father and husband. The work will be here in the morning.” The reality is we do need to balance our work otherwise it can suffocate us, creating an unhealthy imbalance. In addition to work overload being unhealthy, it can also pull you physically and mentally away from family, friends, and other important life events. Your significant others do not deserve anything less than a 100% YOU. Set a start/end time goal and stick to it. Whether you are finished or not come the end time, leave your work behind for the next day. Add personal activities to your work calendar(s). Marrying work and home-life tasks on one platform will allow you to see your entire day at glance. Also, set alerts so you are not late for practice or your dinner date. Stock up on sticky notes. When it is time to go, it is time to go! Write out your to-do list for the following morning, slap it on your desk, and leave! Join an exercise class at a gym. After going to a few sessions, you will quickly become a regular in the group and people will recognize your presence. You also will not want to miss due to the social accountability. Stay in touch with your spiritual self. Meditation and other mindfulness activities will bring peace to you and take your imagination off of work. Disconnect from emails. Having email synced to your smartphone is both a blessing and a curse. Refrain from using evening personal time to check emails. When you navigate the halls in your school, what sounds do you hear? Is it quiet? Do you hear students or teachers? What about in the classrooms? Are classes generally quiet, loud, or a mix? I encourage you to listen closely to the sounds in your school. When I started off as an administrator, my thoughts of a productive classroom were narrow. I assumed quiet classrooms were always effective environments. I also thought classrooms that were noisy, loose, and less structured were a bit chaotic. I admit my vision was distorted and inaccurate. Over the years, my understanding of a highly engaged classroom has developed. Surely at times it’s important to have quiet, voice level zero, classrooms. Such classroom settings would be optimal when kids are taking an assessment, for example. But when kids aren’t deeply concentrating on a test, classrooms should be somewhat noisy and ladled with student talk. The student chatter may very well contribute learning. Student talk that is relevant, positive, and academic in nature increases learning. This talk, supported by teacher modeling of explicit collaboration protocols, is a recipe for effective discourse. 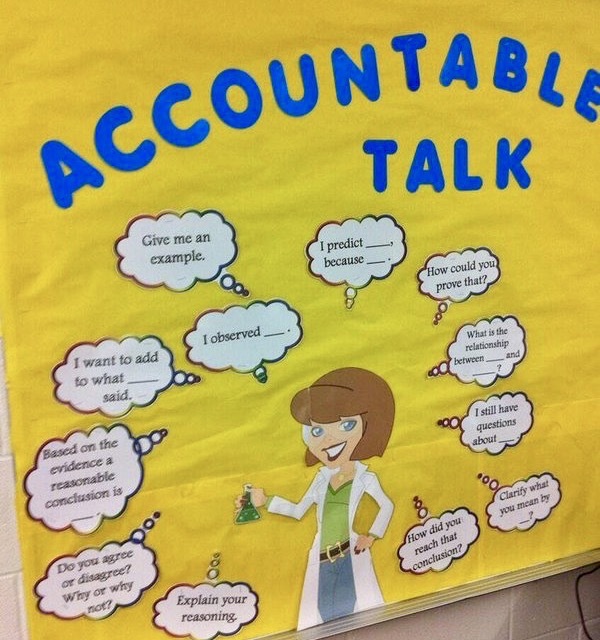 For example, when students use Accountable Talk stems like the picture above, the classroom dialogue is structured and designed to engage students in a safe, productive way. With Accountable Talk, kids share ideas, reference texts, and agree and/or respectfully disagree with their peers. Teachers sustain this positive classroom environment by facilitating student discussions and encouraging kids to keep talking. Teaching these communication skills and allowing kids to practice in a safe environment will surely strengthen the learning in the classroom. It also shifts the focus of ownership from the teacher to the students. How are kids communicating in your classroom? Have you set some parameters for student talk? I encourage you to create, model, and incorporate a set of classroom discussion bubbles. These prompts will help all students organize their thoughts and communicate effectively and respectfully. Students will learn that these talking prompts are also applicable to situations outside of the classroom. Last year I received a bracelet for a gift. The rubber-beaded jewelry was mostly clear with the exception of one white and black bead. This was my first time seeing that kind of bracelet. I was told it was a Lokai band. I smiled, playing off the fact I didn’t know what a ‘Lokai’ band was. I figured it was just a regular bracelet but I soon learned the meaning behind the bands. 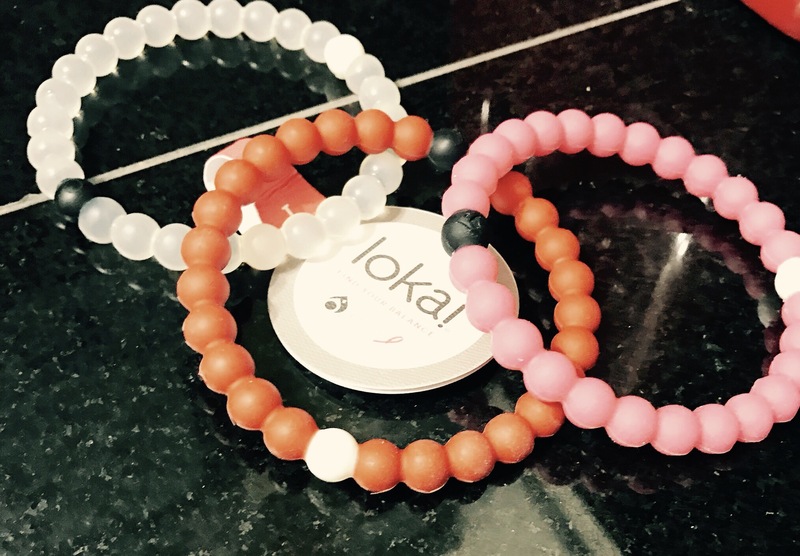 Later that evening I looked up Lokai and was instantly intrigued. The bands are infused with water from Mt. Everest and mud from the Dead Sea. These infusions represent the highest and lowest points on earth. When we’re riding the high wave in life and things are going well, don’t forget to stay humble. When we’re low and feeling down or hopeless, don’t forget to keep the faith. As I continued to surf the site I found that 10% of the profits from the bands are donated to charity partners. I have many connections to the charity partners both personally and professionally, being an educator. “Sour Patch Watermelon,” I said to Ainsley as I continued to walk down the hallway to my meeting. Ainsley asked me what my favorite candy was that day in the hallway. I didn’t think much of the interaction between Ainsley and I until a few days later when I walked into my office to start the day. On my desk was a wrapped box with a card attached. As I unwrapped the small box, I noticed a familiar pink and green design. Sour Patch Watermelon! I was totally surprised and excited! The hand written note attached served as a great pairing to the sweet treats. 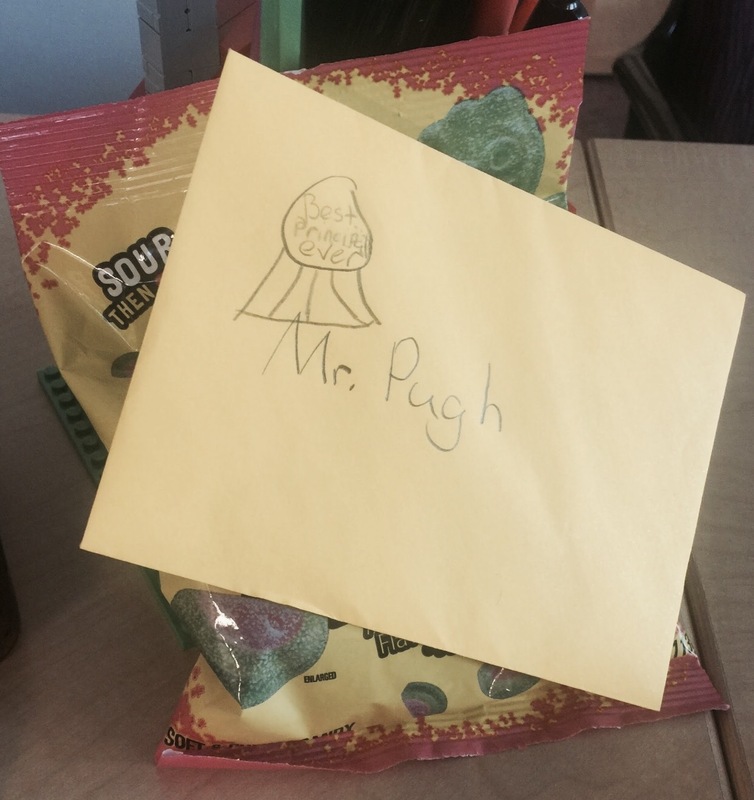 In the note from Ainsley, she explained how she remembered Sour Patch Watermelon being my favorite candy and she welcomed and thanked me for being her new principal this year. I was touched and impressed with her ability to remember something that I personally enjoy. If people feel well, they will do well. “Back to school barbecue.” Host this event for staff and their families. Staff rarely get the chance to come together informally with their families so seize the opportunity for fellowship and fun. A local park may serve as an excellent venue. Winter Holiday Meal. Spread some winter holiday cheer by putting on a breakfast or lunch. Staff will appreciate the chance to come together over great food. Promote a staff member by asking them to give opening and closing remarks to the group. Sweet Treats. Donuts or home-baked goods in the lounge area are sweet pieces of gratitude for staff. They taste even better when it is not a specific recognition, but rather just a thank you gesture. Recognition slips. Encourage staff to write quick thank you notes to one another and place them in a central location. Use daily announcements or email to share the positive slips. This activity aligns very well with your school’s PBIS program. Sticky Notes. Sticky notes are my favorite! There is something powerful about a sticky note left on a desk. Be intentional with your messages-looking to highlight something positive and specific you noticed. My first week of school was spent walking around and leaving sticky notes in every classroom. With the emphasis on texting and typing nowadays, taking the time to put ink on a piece of paper is a gift in itself. Roll up your sleeves. Be a helpful hand around the school. Go outside for recess duty. Work in the cafeteria. Support the custodial staff. Sit at the front desk and answer the phone. Take over a classroom while the teacher gets a bathroom break. Show that you are a leader that will work shoulder to shoulder with your teammates. Social Media Shout Out. Use social media to give your staff positive recognition. Use the popular hashtag #proudMIeducator when tweeting something positive in your school. It is sad that many educators are generally not feeling the love in schools. The demands and challenges are great and at times may feel unmanageable. If you sense your staff may be feeling this way, start by focusing on what you can control-your building. Be genuine and thoughtful with your gestures. Your staff need to know that you understand them and you recognize all that they are contributing to the school. I’m sure you have a student like Ainsley that makes you feel special. Remember that feeling and pay it forward throughout the year. Mr. Pugh & Ainsley, December, 2016.